The Taj Cape Town has been called the city’s oldest new hotel because of the two historic buildings it occupies, but its location in the heart of the Mother City also sets it apart. 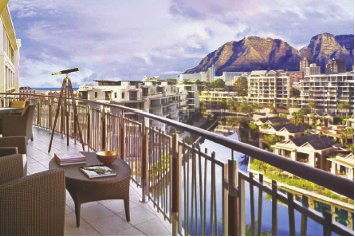 Housed in the Temple Chambers (also known as the Board of Executors -1896) and the original South African Reserve Bank (1932) buildings, seventeen new storeys have been added in a dramatic tower, offering panoramic views of the city and Table Mountain. It is set in a precinct steeped in history, from the neighbouring Slave Lodge to St. George’s Cathedral. The heart of Cape Town with its art, culture, cuisine and entertainment is on the doorstep including Company Gardens and the Houses of Parliament. Inside the hotel, the care taken to retain the integrity of the heritage buildings is apparent. The lobby is dominated by a massive skylight, supported by four fluted marble columns, all of which have been meticulously restored. Even the clock, which first kept banking hours in 1932, has been polished and repaired. The 177 rooms include Heritage Rooms, blending old-world grandeur and modern amenities. The Tower Rooms combine contemporary luxury and exceptional mountain and city views. On the top floor is a two-bedroom, split-level Presidential Suite with its own massage and steam rooms, fully equipped kitchen, office, gym and a expansive top-floor deck for outdoor entertainment. ? ?A Taj Club floor, a feature of all Taj hotels, includes a private lounge served by a dedicated butler team, providing breakfast and evening canapés and cocktails. There are three restaurants: Mint, an all-day contemporary dining restaurant with a classic grill menu; the Bombay Brasserie, a fine-dining Indian restaurant modelled on its famous namesake in London; and The Twankey, a seafood and champagne bar offering seafood tapas and a selection of top South African wines. ? ?A cocktail bar and cigar lounge offer the finest cocktails and limited edition cigars. Other facilities include a formal lounge, cocktail bar, cigar bar, a gym and a Jiva Grande Spa. The Jiva Spa concept is unique to Taj Hotels and draws on Ayurveda, an ancient Indian healing tradition, to offer a number of signature treatments, yoga and meditation. Conference, meeting and banqueting facilities on the first floor include seven meeting rooms, the largest of which can accommodate 110 people, and views overlooking St. George’s Cathedral and Table Mountain. Established in 1903, Taj Hotels Resorts and Palaces is one of Asia’s largest and finest group of hotels, comprising 65 hotels in 45 locations across India with an additional 15 international hotels in the Maldives, Malaysia, Australia, UK, USA, Bhutan, Sri Lanka, Africa and the Middle East. From world-renowned landmarks to modern business hotels, idyllic beach resorts to authentic Grande Palaces, each Taj hotel offers an unrivalled fusion of warm Indian hospitality, world-class service and modern luxury. The Taj, a symbol of Indian hospitality, has recently completed the centenary of its landmark hotel, The Taj Mahal Palace, Mumbai.